If you're a novice or pro cartoonist, maybe you love cars, or you're any combination thereof, you are going to love this one. How To Draw Cartoon Cars is 144 pages of fun filled facts and entertainment about the process for drawing your favorite vehicles. It's a great resource for everything from animation, comic books and even tattoos. 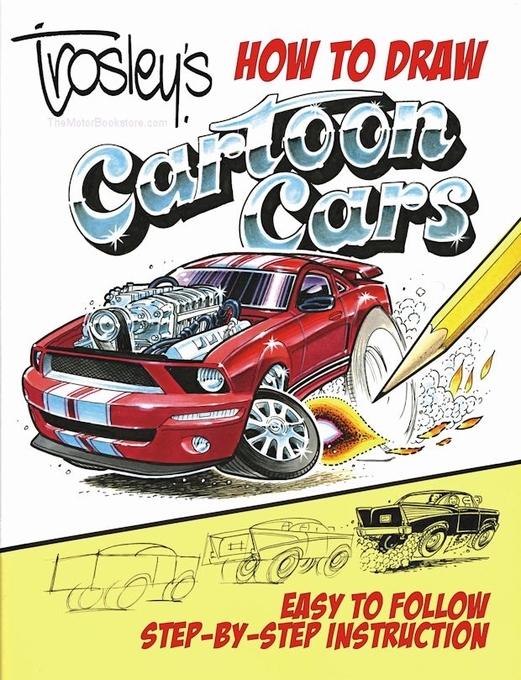 This is not only a how-to draw cartoon cars book, it's a master class on what to do when you pick up a pencil and piece of paper to draft any type of creation. It provides basics that include coloring, profiles, perspective and attitudes, all of which can be applied to just about any draw project. For the specifics of cars, the book has all the details on speed, custom graphics and how to delineate components like engines, wheels and accessories, as well as how to approach different body styles. Follow simple instructions on the approach to car and truck bodies, and chrome and frames. Get specific with pickups, 4x4s, dragsters, monster trucks, muscle cars, off road rides and goodies like Mustangs, Corvettes, VWs, Indy cars, Datsuns and more. The author manages to get to all the technical aspects of the art while maintaining a flowing style that endorses the fun you should be having learning with a how-to draw cartoon cars book. 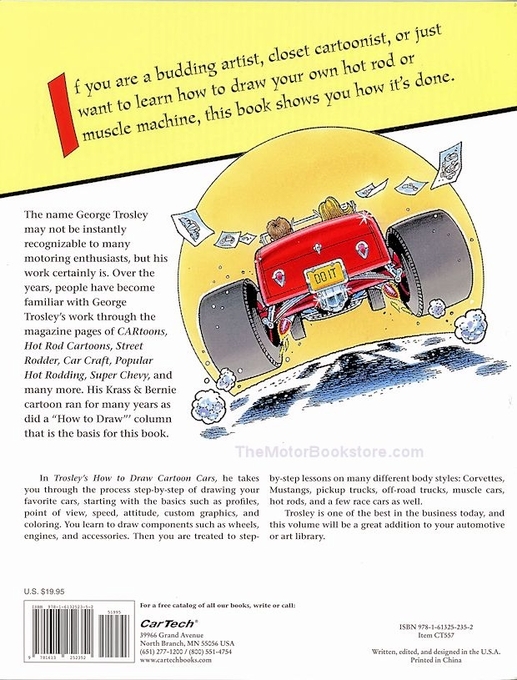 That may be because George Trosley is a renowned cartoonist, car enthusiast and contributing artist to CYCLEtoons, Hot Rod Cartoons and CARtoons, all highly regarded resources of auto Americana. When he's not crouched over a drawing board or creating custom car art portraits, he's drooling over the '39 Ford Deluxe Tudor in his garage. Like we said, car lover or cartoonist, you are going to love How to Draw Cartoon Cars. 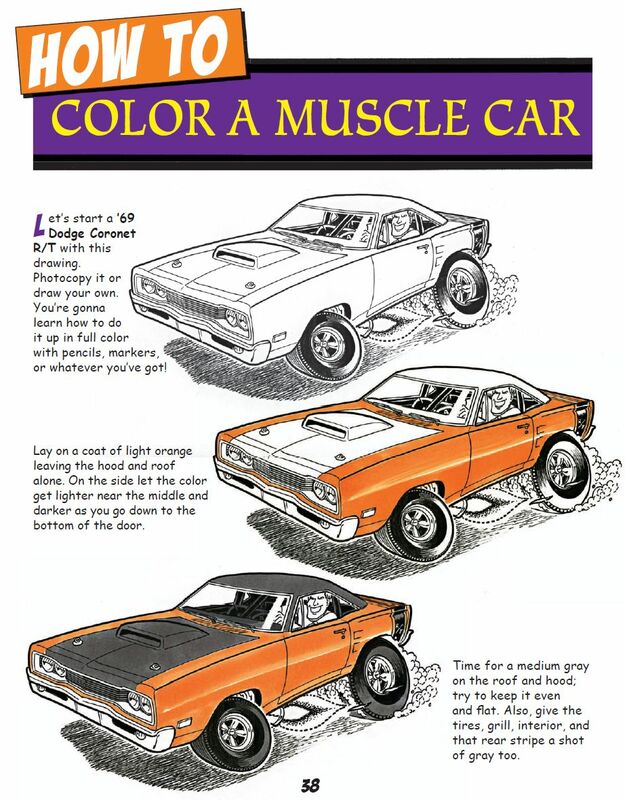 Refer to the Specifications Tab for a sample page from this book which discusses How To Color a Muscle Car. Below: Trosley's How to Draw Cartoon Cars by George Trosley Sample Page (How To Color Muscle Cars). Copyright CarTech Books. 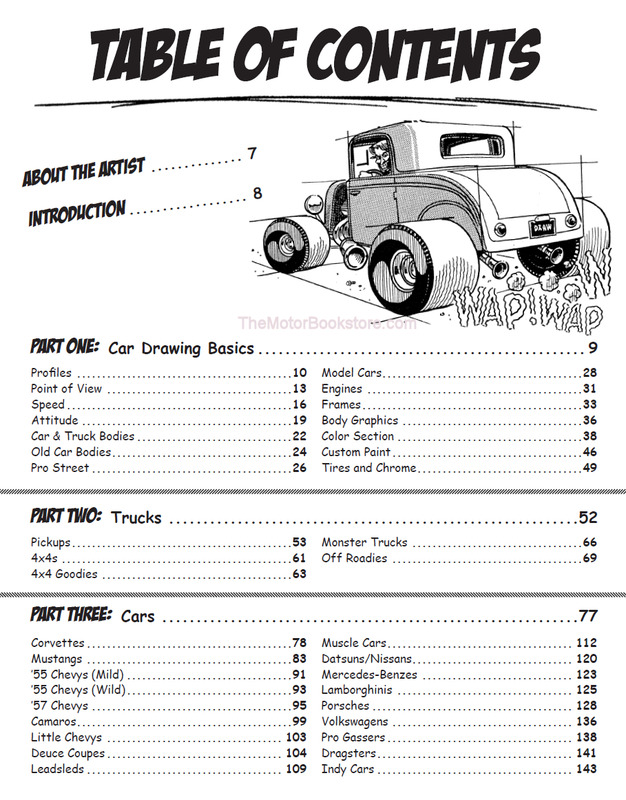 Above: Trosley's How to Draw Cartoon Cars - Table of Contents. Copyright CarTech Books. Ask a question about How to Draw Cartoon Cars by George Trosley.